David Ortiz - 1B BOS Fanduel: 4200 Draftkings: 5400 - Ortiz will battle Yovani Gallardo at Oriole Park at Camden Yards (Baltimore, Maryland). 10, so expect some runs to be scored. Gallardo has an ERA against lefties of 6.75 with a wOBA of 0.359. His ERA at home is 3.33 and his wOBA is 0.348. During his career, Ortiz has faced Yovani Gallardo 10 times with a slugging percentage of 0.800 with 1 homeruns. Through the last seven days, Ortiz has scored 14.2 Fanduel fantasy points while his season average is 13.2. He has a batting average of 0.381 and a slugging percentage of 0.714 over that time. He also has hit 2 homeruns. Ortiz on the road is money. His ISO is 0.237 and has a wOBA of 0.346. Ortiz hits righties very hard. His ISO is 0.363 and has a wOBA of 0.441. He should be in for a great game as long as he is starting. Albert Pujols - 1B LAA Fanduel: 3100 Draftkings: 3600 - Pujols goes against Ariel Miranda at Angel Stadium of Anaheim (Anaheim, California). Miranda has an ERA against righties of 3.60 with a wOBA of 0.398. Additionally, he isn't doing well on the road. His ERA on the road is 13.5 and his wOBA is 0.419. Pujols at home is awesome and his ISO is 0.220 and has a wOBA of 0.352. This guy should crush it today if he is starting. Chris Davis - 1B BAL Fanduel: 3700 Draftkings: 3900 - Davis is facing Eduardo Rodriguez at Oriole Park at Camden Yards (Baltimore, Maryland). Look for some runs with an over under of 10, so expect a lot of runs to be scored. Rodriguez has an ERA against lefties of 3.60 with a wOBA of 0.334. In addition, he is really struggling on the road. His ERA on the road is 5.81 and his wOBA is 0.354. During his career, Davis has faced Eduardo Rodriguez 14 times with a slugging percentage of 0.143. Davis hits lefties in a big way, with an ISO of 0.197 and has a wOBA of 0.334. His matchup it too much to overlook. Mitch Moreland - 1B TEX Fanduel: 3300 Draftkings: 4600 - Moreland will be seeing Andrew Triggs at Globe Life Park in Arlington (Arlington, Texas) which ranks number 7 in runs scored. 10.5, so expect a lot of runs to be scored. Triggs has an ERA against lefties of 6.19 with a wOBA of 0.335. on the road. His ERA on the road is 7.11 and his wOBA is 0.366. Throughout the last 7 days Moreland has scored 10.5 Fanduel fantasy points while his season average is 8.3. He has a batting average of 0.300 and a slugging percentage of 0.650 over that time. He also has hit 2 homeruns. Moreland at home is awesome and his ISO is 0.314 and has a wOBA of 0.391. Moreland hits righties big time, to the tune of an ISO of 0.226 and has a wOBA of 0.334. Edwin Encarnacion - 1B TOR Fanduel: 4200 Draftkings: 4700 - Encarnacion will face Michael Pineda at Yankee Stadium (New York, New York). Pineda has an ERA against righties of 5.79 with a wOBA of 0.338. He really isn't doing well at home. His ERA at home is 5.04 and his wOBA is 0.340. Through the times they faced eachother, Encarnacion has faced Michael Pineda 25 times with a slugging percentage of 0.440 with 1 homeruns. Through the last seven days, Encarnacion has scored 13.9 Fanduel fantasy points while his season average is 12.9. He has a batting average of 0.333 and a slugging percentage of 0.714 over that time. He also has hit 2 homeruns. Encarnacion on the road crushes it. He has an ISO of 0.251 and has a wOBA of 0.36. Encarnacion hits righties in a big way, with an ISO of 0.280 and has a wOBA of 0.382. Jose Altuve - 2B HOU Fanduel: 3800 Draftkings: 4900 - Altuve will be taking on Jaime Garcia at Minute Maid Park (Houston, Texas). Garcia has an ERA against righties of 4.39 with a wOBA of 0.311. Also he has not done well on the road. His ERA on the road is 5.04 and his wOBA is 0.359. During the last week of games, Altuve has scored 17.2 Fanduel fantasy points while his season average is 14.1. He has a batting average of 0.480 and a slugging percentage of 0.680 over that time. Altuve at home is awesome and his ISO is 0.211 and has a wOBA of 0.367. Altuve hits lefties very hard. His ISO is 0.241 and has a wOBA of 0.457. This guy should get some good fantasy points. Rougned Odor - 2B TEX Fanduel: 3600 Draftkings: 5200 - Odor will be pitted against Andrew Triggs at Globe Life Park in Arlington (Arlington, Texas) which ranks number 7 in runs scored. There's a high over under on this game, 10.5, so get ready for a lot of runs. Triggs has an ERA against lefties of 6.19 with a wOBA of 0.335. Also he isn't getting it done on the road. His ERA on the road is 7.11 and his wOBA is 0.366. Odor at home is money. His ISO is 0.222 and has a wOBA of 0.345. Odor hits righties extremely hard. His ISO is 0.231 and has a wOBA of 0.345. This guy should crush it today if he is starting. Daniel Murphy - 2B WAS Fanduel: 4400 Draftkings: 5600 - Murphy will face Chad Bettis at Coors Field (Denver, Colorado) which ranks number 1 in runs scored and number 2 in home runs allowed. This game has a high over under of 11.5, so get ready for a lot of runs. Bettis has an ERA against lefties of 4.98 with a wOBA of 0.337. at home. His ERA at home is 5.37 and his wOBA is 0.351. Through the last seven days, Murphy has scored 14 Fanduel fantasy points while his season average is 12.8. He has a batting average of 0.278 and a slugging percentage of 0.556 over that time. Murphy on the road0.301 and has a wOBA of 0.431. Murphy hits righties extremely hard. His ISO is 0.274 and has a wOBA of 0.428. Look for a big game. Ben Zobrist - 2B CHC Fanduel: 3100 Draftkings: 4200 - Zobrist squares off verse Matt Garza at Wrigley Field (Chicago, Illinois). Garza has an ERA against switch hitters of 6.35 with a wOBA of 0.372. In addition he really has been pretty weak on the road. His ERA on the road is 5.4 and his wOBA is 0.357. Zobrist at home is incredible. His ISO is 0.141 and has a wOBA of 0.328. Zobrist hits righties big time, to the tune of an ISO of 0.175 and has a wOBA of 0.359. Jonathan Schoop - 2B BAL Fanduel: 3100 Draftkings: 3400 - Schoop goes against Eduardo Rodriguez at Oriole Park at Camden Yards (Baltimore, Maryland). There over under on this game is pretty big at 10, so expect a lot of runs to be scored. Rodriguez has an ERA against righties of 5.98 with a wOBA of 0.358. Also he has been playing poorly on the road. His ERA on the road is 5.81 and his wOBA is 0.354. During their career, Schoop has faced Eduardo Rodriguez 7 times with a slugging percentage of 0.143. During the past week Schoop has scored 9.9 Fanduel fantasy points while his season average is 9.6. He has a batting average of 0.273 and a slugging percentage of 0.500 over that time. Schoop at home crushes it. He has an ISO of 0.217 and has a wOBA of 0.36. He has a nice matchup today. Adrian Beltre - 3B TEX Fanduel: 3300 Draftkings: 4800 - Beltre is going against Andrew Triggs at Globe Life Park in Arlington (Arlington, Texas) which ranks number 7 in runs scored. This could be a shoot out with an over under of 10.5, so I think you should expect a lot of fantasy points being scored. Triggs has an ERA against righties of 4.98 with a wOBA of 0.356. In addition, he is really struggling on the road. His ERA on the road is 7.11 and his wOBA is 0.366. During the last week of games, Beltre has scored 17.6 Fanduel fantasy points while his season average is 10.5. He has a batting average of 0.500 and a slugging percentage of 0.808 over that time. He also has hit 2 homeruns. Beltre at home is money. His ISO is 0.167 and has a wOBA of 0.376. Beltre hits righties in a big way, with an ISO of 0.160 and has a wOBA of 0.322. Manny Machado - 3B BAL Fanduel: 4000 Draftkings: 5000 - Machado is taking on Eduardo Rodriguez at Oriole Park at Camden Yards (Baltimore, Maryland). 10, so I think you should expect a lot of fantasy points being scored. Rodriguez has an ERA against righties of 5.98 with a wOBA of 0.358. on the road. His ERA on the road is 5.81 and his wOBA is 0.354. When they have faced eachother, Machado has faced Eduardo Rodriguez 13 times with a slugging percentage of 0.462. Machado at home is great! His ISO is 0.264 and has a wOBA of 0.402. Machado hits lefties extremely hard. His ISO is 0.209 and has a wOBA of 0.387. Signs are pointing up for him today. Nolan Arenado - 3B COL Fanduel: 4200 Draftkings: 5500 - Arenadowill go against Gio Gonzalez at Coors Field (Denver, Colorado) which ranks number 1 in runs scored and number 2 in home runs allowed. The over under on this game is huge, at 11.5, so expect a high scoring game. Gonzalez has an ERA against righties of 4.50 with a wOBA of 0.326. His ERA on the road is 4.34 and his wOBA is 0.320. Arenado at home is awesome and his ISO is 0.348 and has a wOBA of 0.437. Arenado hits lefties big time, to the tune of an ISO of 0.283 and has a wOBA of 0.387. His matchup it too much to overlook. Travis Shaw - 3B BOS Fanduel: 2600 Draftkings: 3900 - Shaw will face Yovani Gallardo at Oriole Park at Camden Yards (Baltimore, Maryland). Look for some runs with an over under of 10, so expect some runs to be scored. Gallardo has an ERA against lefties of 6.75 with a wOBA of 0.359. His ERA at home is 3.33 and his wOBA is 0.348. Shaw hits righties big time, to the tune of an ISO of 0.192 and has a wOBA of 0.34. Ryon Healy - 3B OAK Fanduel: 2700 Draftkings: 3000 - Healy is facing Lucas Harrell at Globe Life Park in Arlington (Arlington, Texas) which ranks number 7 in runs scored. There's a high over under on this game, 10.5, so expect a lot of runs to happen! Harrell has an ERA against righties of 4.70 with a wOBA of 0.357. He really isn't doing well at home. His ERA at home is 6.23 and his wOBA is 0.359. During the last week of games, Healy has scored 10.2 Fanduel fantasy points while his season average is 8.2. He has a batting average of 0.273 and a slugging percentage of 0.682 over that time. He also has hit 3 homeruns. Healy on the road0.250 and has a wOBA of 0.325. Trea Turner - SS WAS Fanduel: 4300 Draftkings: 5400 - Turner faces Chad Bettis at Coors Field (Denver, Colorado) which ranks number 1 in runs scored and number 2 in home runs allowed. This game has a high over under of 11.5, so get ready for a lot of runs. Bettis has an ERA against righties of 5.52 with a wOBA of 0.351. He really isn't doing well at home. His ERA at home is 5.37 and his wOBA is 0.351. Over the last week Turner has scored 17.9 Fanduel fantasy points while his season average is 13.7. He has a batting average of 0.345 and a slugging percentage of 0.586 over that time. Turner on the road is awesome and his ISO is 0.160 and has a wOBA of 0.376. Turner hits righties very hard. His ISO is 0.265 and has a wOBA of 0.407. Elvis Andrus - SS TEX Fanduel: 2600 Draftkings: 3900 - Andrus will be facing Andrew Triggs at Globe Life Park in Arlington (Arlington, Texas) which ranks number 7 in runs scored. Look for some runs with an over under of 10.5, so I think you should expect a lot of fantasy points being scored. Triggs has an ERA against righties of 4.98 with a wOBA of 0.356. Also he isn't getting it done on the road. His ERA on the road is 7.11 and his wOBA is 0.366. Andrus at home0.142 and has a wOBA of 0.331. J.J. Hardy - SS BAL Fanduel: 2500 Draftkings: 3300 - Hardy will be pitted against Eduardo Rodriguez at Oriole Park at Camden Yards (Baltimore, Maryland). There over under on this game is pretty big at 10, so I think you should expect a lot of fantasy points being scored. Rodriguez has an ERA against righties of 5.98 with a wOBA of 0.358. In addition, he is really struggling on the road. His ERA on the road is 5.81 and his wOBA is 0.354. Hardy hits lefties in a big way, with an ISO of 0.183 and has a wOBA of 0.32. He has a great matchup today. Carlos Correa - SS HOU Fanduel: 4200 Draftkings: 4000 - Correa will face Jaime Garcia at Minute Maid Park (Houston, Texas). Garcia has an ERA against righties of 4.39 with a wOBA of 0.311. Additionally, he isn't doing well on the road. His ERA on the road is 5.04 and his wOBA is 0.359. During the past week Correa has scored 22.2 Fanduel fantasy points while his season average is 11.8. He has a batting average of 0.458 and a slugging percentage of 0.917 over that time. He also has hit 3 homeruns. Correa at home is great! His ISO is 0.181 and has a wOBA of 0.348. Correa hits lefties big time, to the tune of an ISO of 0.149 and has a wOBA of 0.332. This guy should crush it today if he is starting. Marcus Semien - SS OAK Fanduel: 3300 Draftkings: 3700 - Semien will go against Lucas Harrell at Globe Life Park in Arlington (Arlington, Texas) which ranks number 7 in runs scored. This game has a high over under of 10.5, so expect a high scoring game. Harrell has an ERA against righties of 4.70 with a wOBA of 0.357. Also he has not done well at home. His ERA at home is 6.23 and his wOBA is 0.359. Semien on the road0.232 and has a wOBA of 0.321. Sandy Leon - C BOS Fanduel: 2900 Draftkings: 3800 - Leon goes against Yovani Gallardo at Oriole Park at Camden Yards (Baltimore, Maryland). There's a high over under on this game, 10, so expect a lot of runs to happen! Gallardo has an ERA against switch hitters of 6.75 with a wOBA of 0.359. His ERA at home is 3.33 and his wOBA is 0.348. Through the last seven days, Leon has scored 17.2 Fanduel fantasy points while his season average is 10.4. He has a batting average of 0.563 and a slugging percentage of 1.000 over that time. Leon on the road is great! His ISO is 0.255 and has a wOBA of 0.439. Leon hits righties extremely hard. His ISO is 0.212 and has a wOBA of 0.398. Jonathan Lucroy - C TEX Fanduel: 3500 Draftkings: 5100 - Lucroy goes against Andrew Triggs at Globe Life Park in Arlington (Arlington, Texas) which ranks number 7 in runs scored. This game has a high over under of 10.5, so expect a lot of runs to happen! Triggs has an ERA against righties of 4.98 with a wOBA of 0.356. Also he has not done well on the road. His ERA on the road is 7.11 and his wOBA is 0.366. During the past week Lucroy has scored 11.7 Fanduel fantasy points while his season average is 10.2. He has a batting average of 0.250 and a slugging percentage of 0.813 over that time. He also has hit 3 homeruns. Lucroy at home is incredible. His ISO is 0.275 and has a wOBA of 0.395. Lucroy hits righties very hard. His ISO is 0.208 and has a wOBA of 0.379. His matchup it too much to overlook. Matt Wieters - C BAL Fanduel: 2800 Draftkings: 3100 - Wieters will face Eduardo Rodriguez at Oriole Park at Camden Yards (Baltimore, Maryland). 10, so expect a high scoring game. Rodriguez has an ERA against switch hitters of 5.98 with a wOBA of 0.358. In addition he really has been pretty weak on the road. His ERA on the road is 5.81 and his wOBA is 0.354. Throughout both of their careers, Wieters has faced Eduardo Rodriguez 9 times with a slugging percentage of 0.556 with 1 homeruns. Wieters at home is incredible. His ISO is 0.218 and has a wOBA of 0.326. He can be in for a very nice game today. Tucker Barnhart - C CIN Fanduel: 2300 Draftkings: 3700 - Barnhart will be pitted against Jose Urena at Great American Ball Park (Cincinnati, Ohio). Urena has an ERA against switch hitters of 9.00 with a wOBA of 0.349. In addition, he is really struggling on the road. His ERA on the road is 5.3 and his wOBA is 0.307. Over the last 7 days Barnhart has scored 9.2 Fanduel fantasy points while his season average is 7.1. He has a batting average of 0.381 and a slugging percentage of 0.524 over that time. Barnhart at home is great! His ISO is 0.211 and has a wOBA of 0.371. Barnhart hits righties very hard. His ISO is 0.134 and has a wOBA of 0.322. Signs are pointing up for him today. George Springer - OF HOU Fanduel: 3800 Draftkings: 4200 - Springerwill go against Jaime Garcia at Minute Maid Park (Houston, Texas). Garcia has an ERA against righties of 4.39 with a wOBA of 0.311. In addition he really has been pretty weak on the road. His ERA on the road is 5.04 and his wOBA is 0.359. Throughout the last 7 days Springer has scored 19.4 Fanduel fantasy points while his season average is 12. He has a batting average of 0.409 and a slugging percentage of 0.727 over that time. Springer at home is great! His ISO is 0.197 and has a wOBA of 0.36. Springer hits lefties extremely hard. His ISO is 0.298 and has a wOBA of 0.417. He has a nice matchup today. 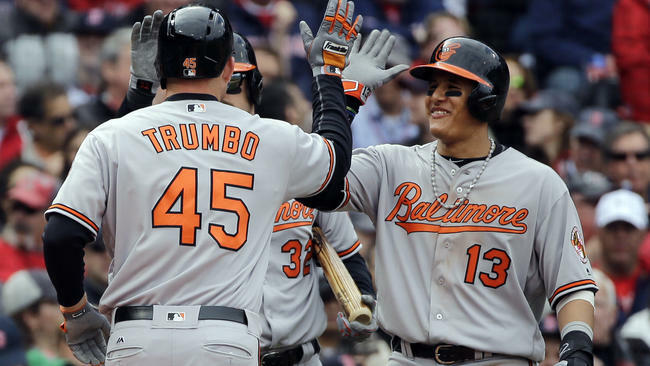 Mark Trumbo - OF BAL Fanduel: 3700 Draftkings: 4400 - Trumbo will be taking on Eduardo Rodriguez at Oriole Park at Camden Yards (Baltimore, Maryland). The over under on this game is huge, at 10, so I think you should expect a lot of fantasy points being scored. Rodriguez has an ERA against righties of 5.98 with a wOBA of 0.358. In addition he really has been pretty weak on the road. His ERA on the road is 5.81 and his wOBA is 0.354. Over the last week Trumbo has scored 13.8 Fanduel fantasy points while his season average is 11.5. He has a batting average of 0.174 and a slugging percentage of 0.565 over that time. He also has hit 3 homeruns. Trumbo at home is great! His ISO is 0.282 and has a wOBA of 0.375. This guy should crush it today if he is starting. Mike Trout - OF LAA Fanduel: 4100 Draftkings: 4400 - Trout will be facing Ariel Miranda at Angel Stadium of Anaheim (Anaheim, California). Miranda has an ERA against righties of 3.60 with a wOBA of 0.398. Also he has not done well on the road. His ERA on the road is 13.5 and his wOBA is 0.419. Through the last seven days, Trout has scored 13.8 Fanduel fantasy points while his season average is 13.7. He has a batting average of 0.222 and a slugging percentage of 0.611 over that time. He also has hit 2 homeruns. Trout at home is awesome and his ISO is 0.237 and has a wOBA of 0.436. Trout hits righties very hard. His ISO is 0.274 and has a wOBA of 0.432. Mookie Betts - OF BOS Fanduel: 4400 Draftkings: 5600 - Betts will be pitted against Yovani Gallardo at Oriole Park at Camden Yards (Baltimore, Maryland). There's a high over under on this game, 10, so expect a high scoring game. Gallardo has an ERA against righties of 3.92 with a wOBA of 0.345. His ERA at home is 3.33 and his wOBA is 0.348. Throughout both of their careers, Betts has faced Yovani Gallardo 9 times with a slugging percentage of 0.333. During the past week Betts has scored 19.5 Fanduel fantasy points while his season average is 14.3. He has a batting average of 0.360 and a slugging percentage of 0.840 over that time. He also has hit 3 homeruns. Betts on the road0.210 and has a wOBA of 0.361. Betts hits righties in a big way, with an ISO of 0.239 and has a wOBA of 0.391. He can be in for a very nice game today. Khris Davis - OF OAK Fanduel: 3400 Draftkings: 4500 - Davis will go against Lucas Harrell at Globe Life Park in Arlington (Arlington, Texas) which ranks number 7 in runs scored. Look for some runs with an over under of 10.5, so expect a lot of runs to happen! Harrell has an ERA against righties of 4.70 with a wOBA of 0.357. He's playing poorly big time at home. His ERA at home is 6.23 and his wOBA is 0.359. Davis has scored 11.7 Fanduel fantasy points while his season average is 10.6. He has a batting average of 0.261 and a slugging percentage of 0.652 over that time. He also has hit 3 homeruns. Davis on the road is incredible. His ISO is 0.235 and has a wOBA of 0.332. Davis hits righties very hard. His ISO is 0.267 and has a wOBA of 0.338. Ian Desmond - OF TEX Fanduel: 4000 Draftkings: 4600 - Desmond will go against Andrew Triggs at Globe Life Park in Arlington (Arlington, Texas) which ranks number 7 in runs scored. There over under on this game is pretty big at 10.5, so expect some runs to be scored. Triggs has an ERA against righties of 4.98 with a wOBA of 0.356. Also he has not done well on the road. His ERA on the road is 7.11 and his wOBA is 0.366. Desmond at home is great! His ISO is 0.205 and has a wOBA of 0.394. Desmond hits righties big time, to the tune of an ISO of 0.185 and has a wOBA of 0.333. He has a nice matchup today. Kole Calhoun - OF LAA Fanduel: 2900 Draftkings: 3700 - Calhoun faces Ariel Miranda at Angel Stadium of Anaheim (Anaheim, California). Miranda has an ERA against lefties of 9.00 with a wOBA of 0.446. Additionally, he isn't doing well on the road. His ERA on the road is 13.5 and his wOBA is 0.419. Calhoun hits righties big time, to the tune of an ISO of 0.142 and has a wOBA of 0.328.